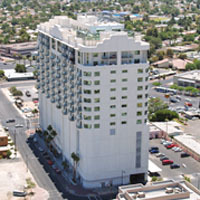 Located in the Arts District of downtown Las Vegas, Nevada, SoHo Lofts LV is a 120 unit high-rise condominium project reaching 17 stories above the famed Las Vegas Boulevard. Each unit is designed with a “loft” feel including exposed ceilings and ductwork, concrete floors, and open spacious floor plans with great views of the Las Vegas Strip and the surrounding Las Vegas valley. Working with Cherry Development on a design-build basis, Breslin Builders provided the initial design concept for the project and coordinated with JMA Architectural Studios, the project architect of record, during the final design development and construction documentation of the project, providing value engineering and constructability reviews throughout the process. SoHo lofts LV is a cast-in-place concrete structure with post tension floor slabs and incorporates panelized exterior wall framing with an EIFS finish. Above the ground floor lobby and retail areas are six levels of enclosed parking garage with the residential unit floors above. 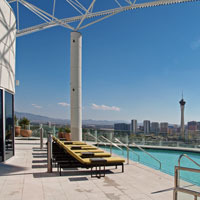 The roof top includes an amenities deck with an exercise room and pool/spa deck area featuring spectacular views overlooking the Las Vegas Strip and surrounding mountains. 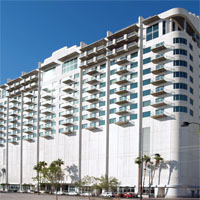 Newport Lofts consists of 168 units reaching 23 stories above the Arts District in downtown Las Vegas. Each unit is designed with a “loft” feel including exposed ductwork and concrete floors, and open spacious floor plans with great views of the Las Vegas Strip and the surrounding Las Vegas Valley. Working with Seegmiller Partners LLC and Cherry Development on a design-build basis, Breslin Builders worked along side of WPH Architecture Inc, the project architect of record, to complete the final look and feel of the project. Breslin Builders was also involved during the final design development and construction documentation phases of the project as well, providing value engineering and constructability reviews during development. 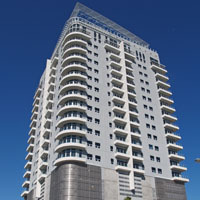 Squeezed on a .48 acre corner parcel, Newport Lofts is built of structural steel with a metal deck/concrete floor system. 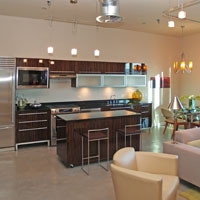 Newport Lofts has six levels of elevated parking area over ground floor lobby area and retail spaces. Above the garage area are the residential unit levels with the building being topped off with an amenity filled area including an exercise room, pool/spa area, and a “clubhouse” overlooking the Las Vegas Strip. Breslin Builders was honored with the “Excellence In Construction” Award from the Las Vegas Chapter of the Associated Builders and Contractor (ABC) for 2007. 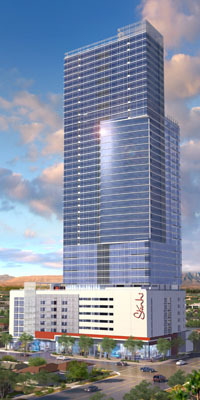 Stanhi is designed to be the tallest building in downtown Las Vegas rising more than 45 stories above the Arts District. Containing 425 luxury condominium units along with a variety of on-site amenities, this project sets the standard for downtown high-rise living. Working for Sam Cherry and Cherry Development, WPH Architecture Inc, the project architect of record, provided the design for this sleek modern glass architecture. Breslin Builders was also involved during the final design development and construction documentation phases of the project as well, providing value engineering and construct ability reviews during development. 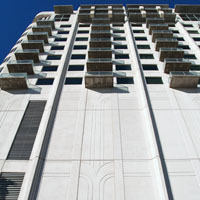 Located on the southwest corner of 3rd Street and Gass Avenue, Stanhi is designed as a cast-in-place structural system. The project has seven levels of elevated parking area over ground floor lobby area and retail spaces. Between the elevated garage areas and below the residential tower, Stanhi contains a unique amenities deck level containing a pool/spa/outdoor cabana area and an indoor “club house” and exercise room area. The residential unit levels finish the balance of the tower with spectacular views of the surrounding mountains and the famed Las Vegas Strip.